The Dim Solo function lets you hear a soloed track at full volume, and the rest of the mix at a considerably lower (dimmed) level. This is very handy when making edits on a track that need to be done in context, but you need to hear the track being edited at a louder volume to make sure you don’t miss any details. 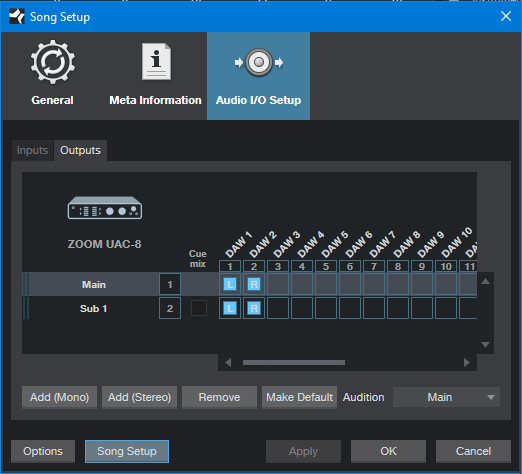 Although Studio One doesn’t have a Dim Solo function per se, it’s easy to set one up! Choose Studio One > Options > Song Setup, and choose the Audio I/O Setup tab. 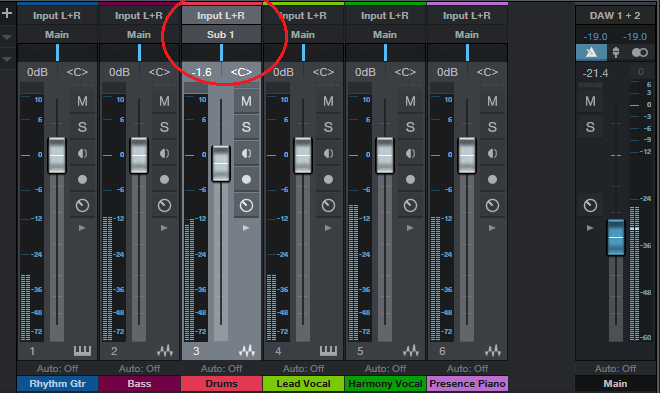 Click on Add Stereo to create a Sub bus, and assign it to the same outputs as your main bus. Assign the track where you want the Dim Solo function to the Sub bus. Now you can bring down the Main bus level to choose the amount of “dimming” for all the tracks except for the one assigned to Sub 1, whose track fader controls its level relative to the rest of the mix—make it as loud as you want, and the other tracks as soft as you want. For an Exclusive Solo function that solos one track while muting all others, click on Solo while holding Alt (Windows)/Option (Mac). If you have several tracks soloed, to un-solo them all at once hold Ctrl while clicking on one of the solo buttons. To restore the same state, click on any Solo button while holding Ctrl, and Studio One will revert to the previous solo button state. Very cool, good to see people checking out alternative solutions. One difference with the technique I described as opposed to the traditional Dim Solo is that the amount of dimming is usually fixed. I find it convenient to be able to vary the level of both the dimmed channels and the solo channel independently. Hi Jim, thanks for the comment! When I was doing tips with Sonar they went into a forum, but PreSonus thought the best place for the Friday Tip of the Week would be the blog. That probably makes sense long-term because sometimes I do tips that are more about production techniques or mixing techniques that aren’t necessarily S1-specific. But, I’m open to anything. so we’ll see how this developes. Why not post your tips and tricks in the forums Tips & Tricks board? We could pin it there and it would be a great place for this. Your tip gave me an idea so there is a script in progress to do that directly, toggle solo in front, without any additional routing required. It dims the master and gains the selected channel by the same amount.